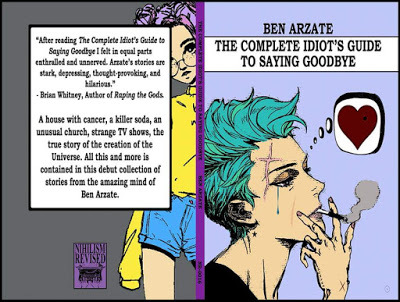 Ben Arzate is something of an enigmatic figure in that he is fairly prominent within edgy alternative political and literary circles but almost never expresses opinions on anything other than his analysis of people’s books. What does he actually believe? Who knows. If we are to follow the clues in his own books, we come no closer to unraveling the mystery except to infer that he might believe that nothing really matters, and one is better served in these turbulent times by taking refuge in the world of transgressive fiction, quietly amusing ourselves with the everyday horrors of contemporary life. A while back I reviewed Ben Arzate’s brief poetry chapbook, which I found to be rather promising. So I was excited to read his new book of short stories, The Complete Idiot’s Guide to Saying Goodbye (published by NihilismRevised, 2018) because I knew it would be longer and have more meat to it (insert that’s what SHE said joke here.) What he excels at brilliantly in this book is in creating characters which behave and communicate realistically within the ridiculously absurd, exaggerated and often sci-fi situations they are placed in. He subtly shatters our idealistic and romantic notions by revealing just how mundane, unremarkable and pathetic our lives really are…in any context. This is the way people in forced relationships really do talk to one another, regardless of whether the “forced” relationship itself is literally due to familial setup or it’s just two people that happen to be dating but aren’t emotionally invested in one another. They’re just going through the motions. A relatable story for me is The Country Musician, which relays a tale of a struggling country music artist named Hank in rather realistic, unromantic and less than heroic terms. This isn’t That Thing Called Love. Hank put the five songs on the Internet. them have gotten any plays in the past month. Almost all of the stories are written in this style of dry, deadpan prose. It’s clearly by design and emphasizes our drab, mechanical, stop-motion animated lives in clownworld. Most of the stories in The Complete Idiot’s Guide to Saying Goodbye have a weird horror/scifi component to them. The story with the same name as the book’s title concerns a house that physically gets cancer. Admittedly, this was one of the more horrifying and grotesque stories for a hypochondriac like me to read. The best way I could describe the stories in this book is that they remind me of the vignettes in 80s-90′s shows like Tales From the Darkside and Monsters, minus any preachy moralizing, important life lessons or poetic justice. I chose those shows to compare the book to specifically rather The Twilight Zone or The Outer Limits, which were often trying to lecture or teach us something about how to make the world a better place. Shows like Monsters only did that to a lesser extent and mostly just aimed to creep out the viewer. That’s how our lives actually are though and The Complete Idiot’s Guide to Saying Goodbye both horrifies and entertains by briefly taking us out of our depraved world of delusions so that we may cringe and laugh at ourselves and everything around us.